On November 10, the Ministry of Industry and Trade (MoIT) transferred its ownership of State capital in groups, corporations to the State Capital Management Committee at a ceremony held at the ministry’s headquarters. 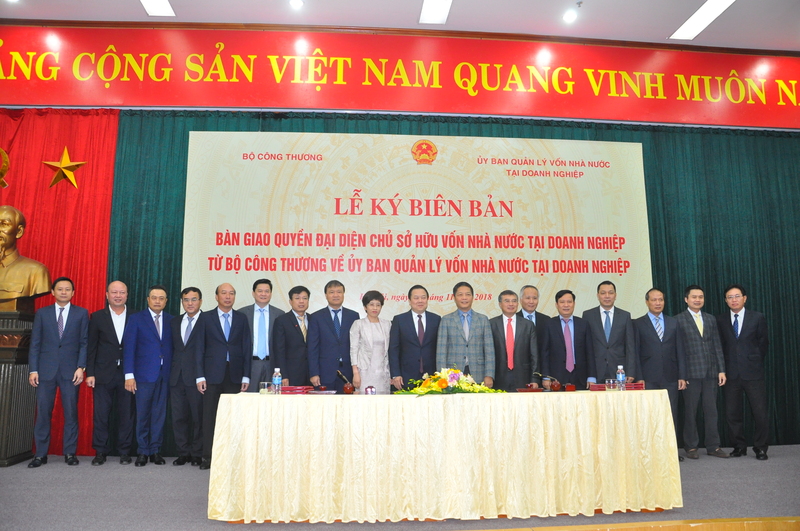 Present at the event were Nguyen Hoang Anh, Party Central Committee member and chairman of the State Capital Management Committee; Tran Sy Thanh, Party Central Committee member, deputy head of the Central Economic Commission, and chairman of the National Oil and Gas Group; and leaders of the Government, Government Office, Ministry of Finance, Ministry of Planning and Investment, and Ministry of Home Affairs; Party Committee of the Central Business Bloc, and Members’ Council, Board of Directors, Supervisory Board of transferred enterprises. 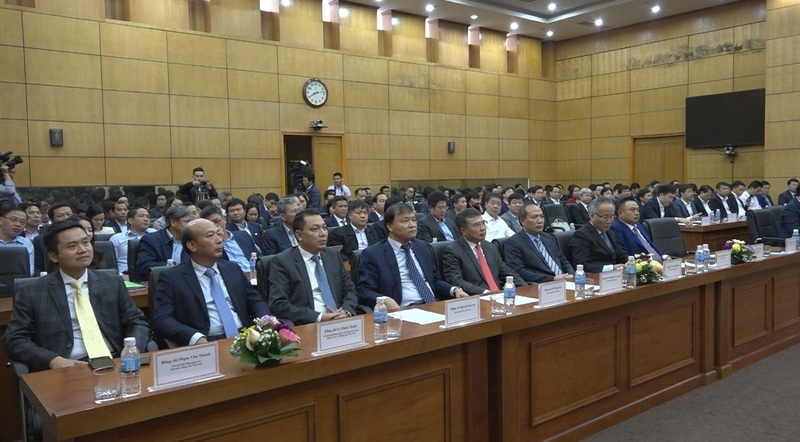 On the MoIT’s side, the ceremony witnessed the attendance of Minister Tran Tuan Anh; deputy ministers Hoang Quoc Vuong, Do Thang Hai, Tran Quoc Khanh, Cao Quoc Hung, and Dang Hoang An; leaders of the ministry’s Party Committee, Vietnam National Union of Workers in Industry and Trade, groups, corporations, and the ministry’s units, among others. Addressing the event, Secretary of the MoIT’s Party Civil Affairs Committee, Minister Tran Tuan Anh said transferring the ownership of State capital in SOEs to the State Capital Management Committee is a huge change, institutionalisation and implementation of the Resolution 12-NQ/TW issued by the fifth plenary session of the 12th Communist Party Central Committee on the establishment of a specialised body that acts as representative of the ownership of State capital in SOEs; with the aim to fix limitations and drawbacks in the old-fashioned State capital management through the establishment of a specialised, professional and accountable body. The MoIT’s six enterprises to be put under the management of the Committee include: the Vietnam National Oil and Gas Group (PVN), the Electricity of Vietnam (EVN), the Vietnam National Coal and Mineral Industries Group (TKV), the National Chemical Group (VINACHEM), the Vietnam National Petroleum Group (PETROLIMEX) and the Vietnam National Tobacco Corporation (VINATABA); that are all large-cap SOEs in which the value of the State ownership was more than VND555 trillion (US$23.6 billion) (more than half of State capital value in the total 19 SOEs that the committee is expected to take control of eventually). The six SOEs in which the ministry played its role as supervisor of State capital are leading economic groups and corporations in the sectors of electricity, coal, oil and gas, petroleum, tobacco, and chemical that have substantial impacts on the national economy and significant contributions to the State budget. Soon after the Decree No 131/2018/NĐ-CP was promulgated, the State Capital Management Committee has actively co-ordinated with relevant ministries, and bodies and to-be-transferred SOEs to carry out functions, tasks and obligations in line with the regulation. At the same time, the Committee has proactively guided the enterprises on the contents of the transfer dossiers and to strictly adhere to the provisions of Decree No 131/2018/NĐ-CP and the guidance of the Prime Minister’s Decision No 1515/QĐ-TTg dated November 09, 2018, detailing regulations and sample documents for the transfer of enterprises to ensure that transfer dossiers are fully and strictly completed and ready for the transfer according to the law. Additionally, the Committee has initially carried out its assigned tasks as the representative body of the State capital ownership in enterprises, leaving no space in the process of handing over SOEs. Before the time of hand-over, the related works between the ministry and Committee were clarified in the spirit of ensuring no interruption to production and business operations of firms, and compliance with current regulations. The two bodies defined coordination mechanism to continue directing and managing enterprises to fulfill their production and business targets for 2018, and to reorganise the enterprises according to the approved plan.